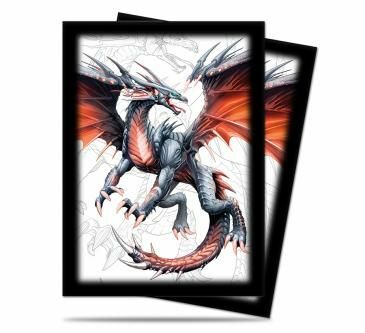 Bring some style and excitement to your next gaming session while protecting your valuable trading card with Ultra PRO's \"Black Dragon\" Deck Protector sleeves, featuring artwork by famed fantasy artist Mauricio Herrera. These sleeves are made with archival-safe polypropylene film, bears Ultra PRO's hologram quality seal and sized to store and protect standard (\"Magic\") sized cards. For games that require shuffling of cards, sleeved cards help create space in between each card in a deck so you can mash shuffle with ease and without damaging your cards. This Deck Protector sleeve design comes in a 50-count pack. Sized to fit standard (Magic) size cards measuring up to 2.5\" x 3.5\"